Doune Castle near Stirling in Scotland is a magnificent Scottish Castle which may be familiar to viewers of television programmes such as Ivanhoe and Monty Python. Doune Castle is now maintained by Historic Scotland. 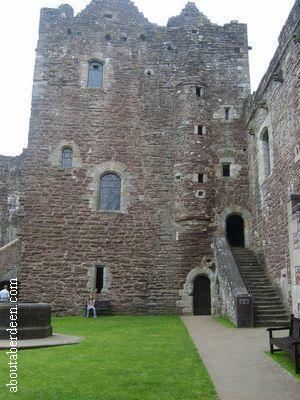 Doune Castle is located on the A84 near to Dunblane and Stirling. It is clearly sign posted and there is plenty of free parking. Entrance to Doune Castle is a short walk from the car park. During the walk up you will see the curtain wall that encloses the castle and would have acted as a defence against any attacks. It is thought that these walls were built in the 1580s by King James VI. Those areas of the curtain wall that have access points for the inhabitants of Doune Castle, such as the postern on the west curtain wall, have defensive points called the machicolation which would have allowed archers to fire down onto attackers. Visitors to Doune Castle near Stirling are treated to a medieval entrance through the gatehouse entrance with portcullis or rather gate. This iron yett is original. The Historic Scotland information centre and shop is to the right. Aboutaberdeen think this was formerly the Doune Castle guardroom and prison and in later years the porter's lodge. 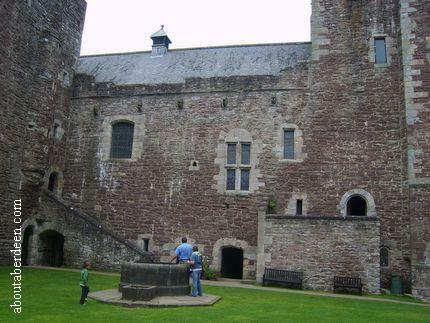 Historic Scotland members can tour Doune Castle for free whilst there is an admission price for non members. Purchases from the gift shop by members of Historic Scotland are given a 20% discount. The staff are very knowledgeable and happy to answer any questions. The tour around Doune Castle is undertaken by oneself and a route is clearly signposted throughout. A guide book is available to buy from the shop. The public toilets are located here and there are no cafe facilities though there are picnic tables and seats around the grounds. 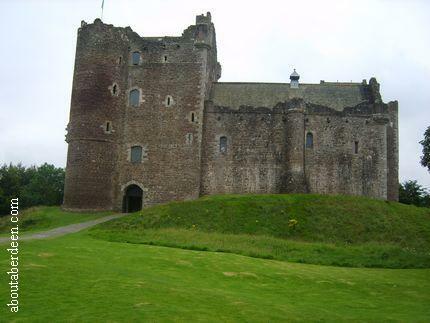 Though the grounds can be managed by a disabled person or someone pushing a buggy or pram the tour of Doune Castle involves many stairs and narrow steps and staircases and may not be suitable for a person with a disability. The walls of Doune Castle are made from dark coloured sandstone that was sourced locally and for the finer detailed walls stone from Ballengeich were used. The rooms to the left of the Historic Scotland visitor centre would have been used as storage cellars. Continuing through the gate house entrance takes visitors to the courtyard. In the centre is a well. The courtyard provides and ideal photo opportunity and great views of the inside walls of Doune Castle and the battlements. There are some benches for visitors to sit and admire the view and soak up the atmosphere of the castle. 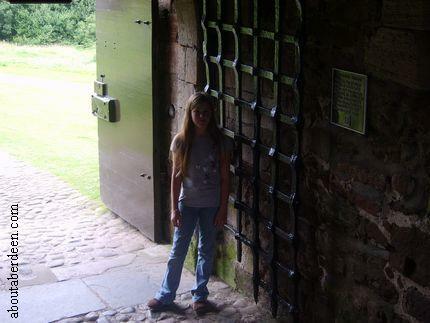 The ground floors were better built cellars with stone floors. Some have hatches in their ceilings to give access above. 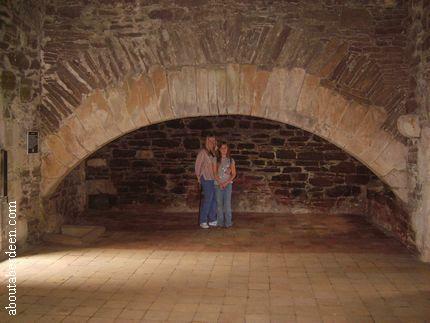 One of these cellars has an exhibition about the many television series and films that have used Doune Castle along with a model of Doune Castle. These include the BBC production of Ivanhoe and the Monty Python film The Holy Grail. There are recollections from the film crew and actors along with photographs. One photo has the return to Doune Castle of the two actors of Monty Python the Holy Grail, Terry Jones and Michael Palin. Climbing the stairs at the far wall takes you to the Great Hall, the Duke's Hall with their chambers, servery and kitchen as well as the Gatehouse Tower. Most of the rooms in Doune Castle contained a small enclosed latrine closet which was unusual for the time and is an example of the desire of the owner, the Duke of Albany, to have the best home and castle in Scotland. This can be seen further with the large fireplaces and huge chimney flues. The Great Hall certainly lives up to its name because it is the largest one that aboutaberdeen.com have seen during our travels around Scottish Castles. Many a fine banquet will have been held here and visitors can still see the Minstrels' Gallery which is a reproduction. The original Minstrel's Gallery was thought to have been much bigger. The Great Hall was restored in 1883. The firebasket in the centre would have been lit in the Duke of Albany's time and there was a smoke hole above. The serving hatches in the kitchen are still visible as are the remains of a bread oven that is thought to date back to 1745, the time of the Jacobite Rising. Aberdonians may mistake the Buttery room for their favourite breakfast food but this Buttery was a food and drink preparation area named after the French word Bouteillerie which translates to bottle store. Wine and ale would have been served from here and a hatch opened into the drink cellar. The Duke's Hall is located in the Gatehouse Tower by the Great Hall and contains an unusual fireplace that had two separate fireplaces side by side. The Duke's Hall would have been used for private meetings or entertaining. 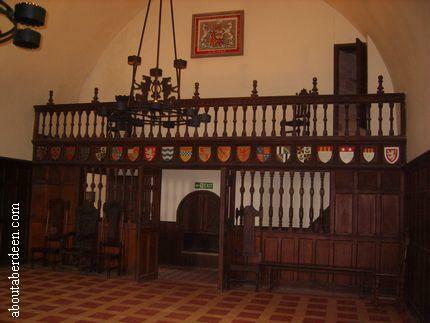 The Duke's Hall was also restored in 1883 and the furniture within is of this time period. An interesting room above the kitchen is the Mary Queen of Scots bedchamber and though named she never went to Doune Castle. This highly decorated room for the time had an ornate fireplace and large windows and it is thought it was reserved for the finest guest of the Duke of Albany. The next set of steps takes visitors to the second floor which housed the Duke's Chamber, the Duchess's Chamber, Duchess's Hall, oratory, chambers, closet and kitchen tower. Thought the Duke's Chamber had an en suite latrine the Duchess's did not and she would have had to walk to the latrine near to the spiral stair. Though she did not have an en suite bedchamber the Duchess did have her own hall that was the same size as her husband's. In addition she had an oratory which was a private chapel. This oratory can still be seen along with the piscina, credence and basin for preparing and washing consecrated vessels. Other rooms on the top floor would have housed the servant quarters and staff bedchambers. Those who do not mind heights and want some stunning views of the gardens from above and surrounding countryside can climb to the roof of Doune Castle which are called the Banner'd Towers o' Doune or battlements. Visitors will be treated to panoramic views of the River Teith, Ardoch Burn and nearby Beinn Deorg and the Menteith Hills. 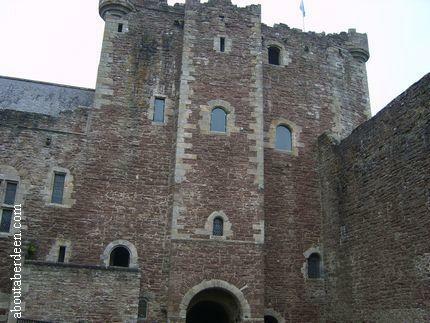 The History of Doune Castle dates back to the times of trouble in the Highlands of Scotland . Doune Castle was strategically placed within the centre of the Earldom of Menteith giving the Earl easy access to the roads whilst offering a retreat. Doune Castle was built by Robert Stewart the Duke of Albany and Governor of Scotland on behalf of his brother King Robert III. Robert Stewart hoped one day to become King of Scotland and it is said that he built Doune Castle to such high specifications for when his dreams would be fulfilled. They never were, though he did have a residence fit for a King in terms of a safe stronghold and opulent castle to demonstrate his wealth and status and was nicknamed Scotland's uncrowned King. The Duke of Albany died aged 80 years in 1420 and it is thought that his castle was never finished being built to his plans. He was thought of as a patient and generous man. His heir was his son Murdoch who was executed by beheading by James I in 1424. 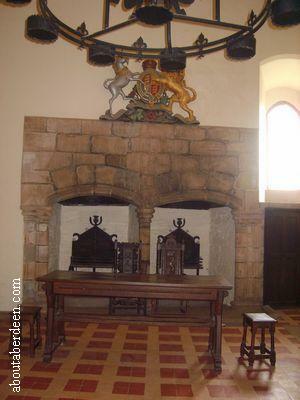 Doune Castle was given over to the Crown and Royal keepers appointed to maintain Castle Doune for the King�s return. The first family of Royal keepers were the Moray family in 1434. A brewery was built in 1467 and the Castle was mostly used as a hunting lodge with Royalty preferring to use nearby Stirling Castle. And so Doune Castle passed to James II, James III, James IV and James V and theirs Queens. It was not until the reign of King James VI that much needed repairs were undertaken by the stonemason Michael Ewing in 1581. More repairs to Castle Doune were carried out during the 1580s by King James VI. The post of Royal keeper befell to the Edmonstoun family in 1468 and then to the Stewart family in the 17th century and remained with the Stewarts. During the battle of Falkirk in 1746 Doune Castle was used to keep redcoat prisoners. One famous prisoner was the Scottish poet John Home who managed to escape. Doune Castle was little used after the Jacobites and fell into ruin until the 14th Earl of Moray undertook architect Andrew Kerr in 1883 to restore the building. The well in the courtyard was built in 1884. The area of Doune Castle has historically been seen as a stronghold and archaeologists have found evidence of Roman forts in the area. Doune is named after the Gaelic word Dun which means fort or stronghold. Doune Castle was leased to the state in 1970 by the Moray estate and is now maintained by Historic Scotland. Doune Castle can be used for weddings and on the day that Aboutaberdeen.com visited a wedding ceremony had just been performed in the Great Hall. Doune Castle is open all year except during the winter months when it closes on a Thursday and Friday and on Christmas Day, Boxing Day and New Year Day. Summer opening times are from 09:30am to 5:30pm whilst winter opening times sees Doune Castle close at 4:30pm.  Admission prices for non Historic Scotland visitors are �4-20 for an adult, �3-20 for a concession and �2-10 for a child. John Mitchie, the actor best known for his role as Detective Inspector Robbie Ross in Taggart, visited Doune Castle for the STV programme Made In Scotland which was broadcast on Scottish Television in the summer of 2009. Archaeologist work at Dounce Castle in recent years has revealed early masonry at the Castle walls and the archaeologists think that there may have been a castle on the site prior to the current building.